Part II Daily Orders – The 60th Battalion C.E.F. 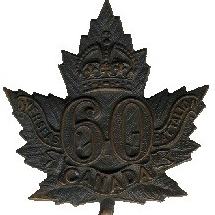 "Victoria Rifles of Canada"
The Battalion Daily Orders were in two parts: the Part I of the daily orders specify who the duty officer was and what activities the battalion would be involved in. They would announce the entertainment for the evening and pass on messages from dignitaries. The orders from October 2, 1915, even announced there was a horse for sale. Part II of the daily orders are far more detailed, recording movements, crimes, punishments, admission and discharges from hospitals, leaves, awards, promotions and casualties. Part II are more detailed mostly because they could effect a mans pay. They were kept in two files; one for the complete set and another for Officers only As time permits I will add all of them. if you wish to see a specific day please let me know and I will add it. The orders numbers 26 through 44 covering the period from August 22 to September 21, 1916 are missing from the Library and Archives of Canada’s files. This covers the period the 60th battalion was on the way to the Somme and during the Canadian Corps attacks at Courcelette.